In this case the value of p is the exact value rather than an approximation. (1) This section contains design methods to determine the structural properties of joints in frames of any type. To apply these methods, a joint should be modelled as an assembly of basic components, see 1.3(1). (2) The basic components used in this Standard are identified in Table 6.1 and their properties should be determined in accordance with the provisions given in this Standard. Other basic components may be used provided their properties are based on tests or analytical and numerical methods supported by tests, see EN 1990. NOTE: The design methods for basic joint components given in this Standard are of general application and can also be applied to similar components in other joint configurations. 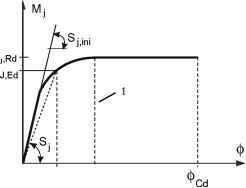 However the specific design methods given for determining the design moment resistance, rotational stiffness and rotation capacity of a joint are based on an assumed distribution of internal forces for joint configurations indicated in Figure 1.2. 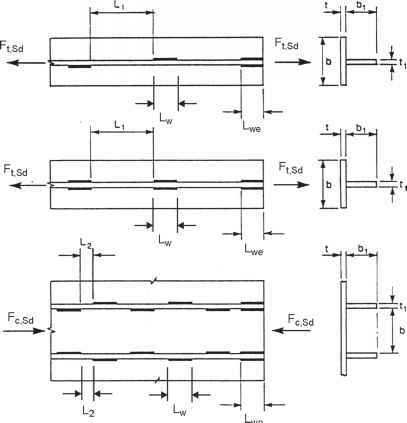 For other joint configurations, design methods for determining the design moment resistance, rotational stiffness and rotation capacity should be based on appropriate assumptions for the distribution of internal forces. (1) A joint may be represented by a rotational spring connecting the centre lines of the connected members at the point of intersection, as indicated in Figure 6.1(a) and (b) for a single-sided beam-to-column joint configuration. The properties of the spring can be expressed in the form of a design moment-rotation characteristic that describes the relationship between the bending moment Hj,Ed applied to a joint and the corresponding rotation ^Ed between the connected members. Generally the design moment-rotation characteristic is non-linear as indicated in Figure 6.1(c). NOTE: In certain cases the actual moment-rotation behaviour of a joint includes some rotation due to such effects as bolt slip, lack of fit and, in the case of column bases, foundation-soil interactions. This can result in a significant amount of initial hinge rotation that may need to be included in the design moment-rotation characteristic. (3) The design moment-rotation characteristics of a beam-to-column joint shall be consistent with the assumptions made in the global analysis of the structure and with the assumptions made in the design of the members, see EN 1993-1-1. (4) The design moment-rotation characteristic for joints and column bases of I and H sections as obtained from 6.3.1(4) may be assumed to satisfy the requirements of 5.1.1(4) for simplifying this characteristic for global analysis purposes. (1) The rotational stiffness Sj, which is the secant stiffness as indicated in Figure 6.1(c), should be taken as that given by 5.1.1(4). For a design moment-rotation characteristic this definition of Sj applies up to the rotation at which Mj,Ed first reaches Hj,Rd , but not for larger rotations, see Figure 6.1(c). The initial rotational stiffness Sj,ini, which is the slope of the elastic range of the design moment-rotation characteristic, should be taken as that given by 6.1.3(4). (1) The design rotation capacity ^Cd of a joint, which is equal to the maximum rotation of the design moment-rotation characteristic, see Figure 6.1(c), should be taken as that given by 6.1.3(4). (1) The design moment-rotation characteristic of a joint should depend on the properties of its basic components, which should be among those identified in 6.1.3(2). (2) The basic joint components should be those identified in Table 6.1, together with the reference to the application rules which should be used for the evaluation of their structural properties. (3) Certain joint components may be reinforced. Details of the different methods of reinforcement are given in 6.2.4.3 and 6.2.6. - for rotation capacity in 6.4.